Global warming, namely the unequivocal and continuing rise in Earth’s climate, is one of the hottest and most debatable issue at the present time. As a scientific intergovernmental and international body under the auspices of the United Nations (UN), the intergovernmental Panel on Climate Change (IPCC) once claimed that the release of the anthropogenic greenhouse gases contributed to as much as 90% or even higher of the observed increase in the global average temperature in the past 50 years. However, worldwide scientists are still skeptical and debate on the possible explanation of the global warming never ends. Research shows that the IPCC’s model tends to underestimate the impact of natural factors on the climate change, while overestimate that of the human activities. As a matter of fact, solar activity is an important ingredient of natural driving forces of climate. A recent study done by space physicists at the State Key Laboratory of Space Weather, the National Space Science Center (NSSC) have demonstrated the high correlations between solar activity and the Earth’s averaged surface temperature during centuries. The result will to a large extend provide a new clue to reveal the cause of global warming in recent years. Supported by NSSC’s “Five Key Cultivation Directions” Fund, Dr. ZHAO Xinhua and Dr. FENG Xueshang combined the measured data with those reconstructed to disclose the periodicities of solar activity during centuries and their correlations with the Earth’s temperature based on the wavelet analysis technique and cross correlation method. Their results demonstrate that solar activity and the Earth’s temperature have significant resonance cycles, and the Earth’s temperature has periodic variations similar to those of the solar activity (Figure 1). The study also implies that the “modern maximum” of solar activity agrees well with the global warming of the Earth during the past century. A significant correlation between them can be found (Figure 2). 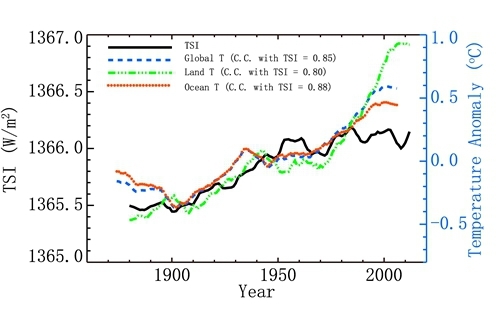 Especially, the correlation between the solar activity and the ocean temperature is higher than the correlation between the solar activity and the land temperature. These results, as pointed out by a peer reviewer, “provide a possible explanation for the global warming”. Their work, entitled Periodicities of solar activity and the surface temperature variation of the Earth and their correlations was published on CHINESE SCIENCE BULLETIN (In Chinese) 2014 No.14. It was reported by the global source for science news, EurekAlert!, both in Chinese and in English entitledHas solar activity influence on the Earth's global warming? on June 3 and June 4, 2014, respectively.